Faith is like a flower. In order to grow, it needs soil, water, and sun―food for the spirit. That’s just what this devotional is. Spiritual food to help your faith grow strong and beautiful. 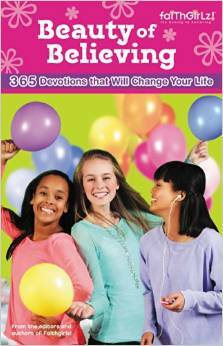 The Beauty of Believing: 365 Devotions that Will Change Your Life features 365 days of wisdom from your favorite Faithgirlz! authors, as well as quotes and questions from real girls like you, this devotional offers pages of inspiration on everything from navigating friendships, to taming the tongue, to trusting God in everything, big and small. Growing up can be tough, but Jesus is guiding you every step of the way. Beauty of Believing combines the talents of Faithgirlz! authors Mona Hodgson, Tasha K. Douglas, Kristi Holl, Lois Walfred Johnson, Allia Zobel Nolan, and Nancy Rue, and their words of wisdom will help your faith bloom and flourish as you grow into the girl God wants you to be. “I actually reviewed this book for my niece (age 8 1/2). The Beauty Of Believing is made up of daily devotionals taken from misc. books. With authors such as: Kristi Holl, Nancy Rue, Tasha Douglas and many more. Each daily devotional begins with a scripture at the top of the page and then a story to explain the topic more clearly. There is also a “More To Explore” (more Bible scriptures to read along with the topic), “Girl Talk” (an application section asking questions such as.. Can you think of a time when…? ), and “God Talk” (a prayer idea to help you pray to our Heavenly Father about the topic of the day).